Nova Southeastern University was pleased to welcome author Salman Rushdie as keynote speaker for the Undergraduate Commencement exercises on May 7, 2006 at the Bank Atlantic Center in Sunrise. Nova Southeastern University awarded Rushdie an honorary doctorate of humane letters. The commencement speech by Rushdie served as a capstone for the year-long interdisciplinary exploration of the theme of "Good and Evil" through classroom activities and public events. Rushdie has written more than 15 novels and short story collections and is the recipient of numerous literary awards, including the Booker Prize for Fiction and the Whitbread Book Award. He is widely regarded as a leading novelist of the 20th century and a strong advocate of free expression in writing. "Rushdie exemplifies not only creative brilliance, but courage," said David McNaron, Ph.D., an associate professor of philosophy in the Division of Humanities. 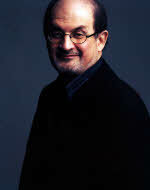 Rushdie gained widespread international attention in 1988. After publication of his novel The Satanic Verses, he was forced into hiding by an Iranian government death sentence issued against him in response to the book. Salman Rushdie was proudly welcomed as an individual who signifies higher education's central role in the open, uncensored examination of social, cultural, and religious issues.